So – here’s the main reason I haven’t posted for quite a while…. Or at least the flimsy excuse I’m giving! 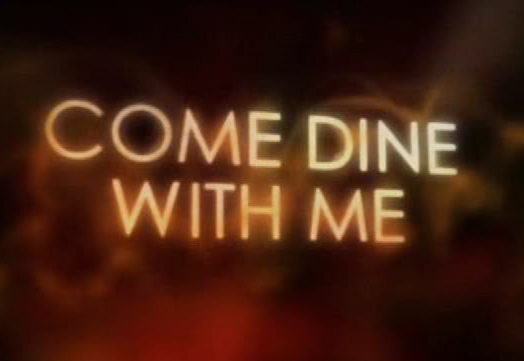 If you aren’t familiar with Come Dine With Me, here’s the premise of this British (reality) series. Five strangers get together to each host a three-course dinner party on successive evenings. At the end of each evening, the guests score the host on his or her hosting/cooking/entertaining skills. The host with the highest score is revealed on the last night and wins £1000, and the title of top dinner party host for the week. The show is a real life comedy, drama, tragedy, cooking show and sometimes worst nightmare all rolled into one. Things invariably go wrong in the kitchen, personalities clash, and the competitiveness of some ALL of the participants fuel each half hour episode and make for sometimes strange and bizarre, but rather entertaining TV. I can’t forget to mention the show’s host/narrator. Dave Lamb (his voice, accent and witty comments!) is a huge reason why I like the show. Throughout each episode he interjects a comical runny commentary about what the participants are doing – or should or shouldn’t be doing! The show runs in half hour episodes (one dinner party per episode) on W Network on Sundays starting at 1 p.m. There are five hosts per show so if you tape or PVR the show and get a bit behind watching them as I have, you’ll have 2-1/2 hours of Come Dine With Me each week to catch up on! You can watch full episodes online as well as get the recipes for dishes the participants prepare for their guests. And, there’s more info about the episodes and the show’s guests on the UK’s Channel 4 Come Dine With Me website which airs the show in Britain. Casting is currently being done for a Canadian version of Come Dine With Me. If you live in the Greater Toronto Area, like to cook and entertain and want to be wined and dined in return, and want to win $1000 as well as the title of best host for the week, apply to be on the show. I’m going to have to watch COME DINE WITH ME, but I wouldn’t dare apply to be on the show. I can think of a few friends who could do so, however. You’d be at the top of that list, Wendi. I’d love to see a show called COME MAKE ART WITH ME. Now THAT I would apply for! Thanks, Carol! How about if we could pool our energies and resources for a show called COME MAKE ART WITH ME AND THEN STAY FOR TEA!